During the 1930s a change began to emerge in perceptions about birds of prey. Instead of being only regarded as vermin to be exterminated, people began to study raptors with admiration. This trend first found noted voice at Hawk Mountain, with the efforts of Rosalie Edge beginning to shape new attitudes focused on stopping the ongoing slaughter of hawks. Places that had only seen shooting soon began to see quiet, peaceful observations of the autumn migration replace the carnage. Lesser known ridge lookouts were scouted and became known in the birding community. Most sites were in eastern Pennsylvania, with Bake Oven Knob being the most notable. By the late 30s two locations west of the Susquehanna River began to attract regular visitors. They were Sterrett’s Gap and Waggoner’s Gap. Reverend E. S. Frey compiled a book of counts made at Sterrett’s Gap. Ted Hake from York County was one of the pioneers at Waggoner’s Gap. He visited from the late 30s into the 90s, but left no recorded counts. The first known counts were made starting in 1948 by Lou Knohr, a high school science teacher at Carlisle High School. Unfortunately, the counts from 48-51 were lost. The first counts extant from 1952 to 1953 were in a summary format by species and obtained from Dr. Bertram Henry. The first daily counts from Waggoner’s Gap were made by Lou Knohr and presented to Dr. C. J. Ralph of Dickinson College. These counts spanned the years 1954-1973 and only listed those raptors seen by Mr. Knohr and his wife Elsie on their frequent visits. A few other counts were recorded during this time and preserved by Dr. Ralph in the archives of the College. By the early 1970s interest in monitoring raptor migration resulted in a count in 1973 sponsored by the Appalachian Audubon Chapter of the National Audubon Society and led by Michael Kotz, a high school student from Harrisburg. This effort of 795 hours has been lost. 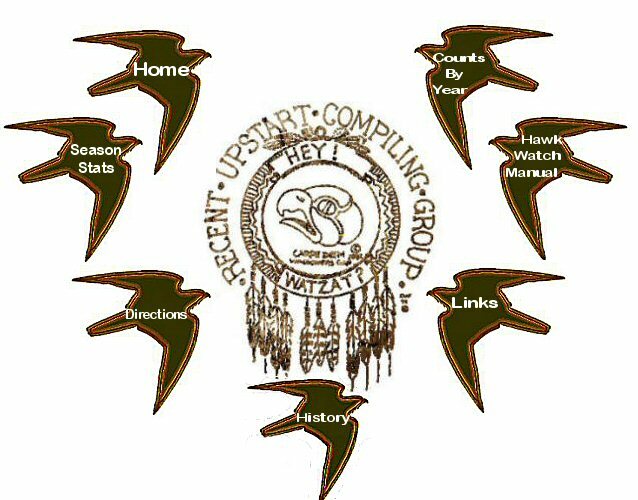 The year 1974 saw the founding of the Hawk Migration Association of North America. Waggoner’s Gap was represented by Dr. Ralph and Malcom Simons Jr. Plans were made to submit the Waggoner’s Gap counts to HMANA using the HMANA forms. Rich Peiffer, a Cumberland Valley High School teacher, was chosen to be compiler. Peiffer, with help from Jake Baum and others, held the job until 1981 when he died from a cancer. Greg Smith, from York, PA then took on the job until 1988, when the job was passed to Kim Van Fleet. She and her husband Glen served until 1994, when Dave Grove became compiler. Hours of observation increased throughout the period and it is now routine for over 1,000 hours of counting to be recorded in a season. The count protocol was oral history until 1998 when a written protocol was adopted by the counters. The land at the site was privately owned until 1953, when the site was purchased by the Reineman Wildlife Sanctuary Trust. In 2001, 20 acres of land encompassing the hawk watch was deeded to Pennsylvania Audubon for the purpose of preserving the site as a hawk watch. That fall a parking lot was built on the north side of the ridge and trails were built from the lot to the hawk watch.